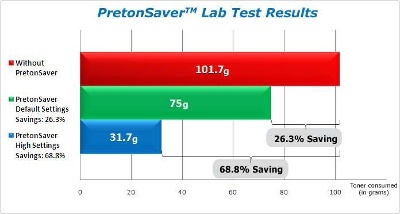 Toner and Ink Saving Software Company, Preton Ltd, announced last month the test results accumulated by the independent research advisor and consultant, bradham360 Ltd. and Industry Analysts, Inc. The test results, as established by bradham360 Ltd and Industry Analysts, Inc, proved that when employing the PretonSaver solution on a mixed content document (with text, graphics, and images), savings of 68.8% were achieved. Furthermore, at a savings level of 26.3%, there was no noticeable reduction in print quality. Malcolm Hancock – Director – bradham360 Ltd.
by weighing the toner cartridges before and after the predetermined number of pages is printed. The weight difference is attributed to the amount of toner consumed by those prints. These tests were conducted 3 times, using a new cartridge each time. Test results, as established by bradham360 Ltd. and Industry Analysts Inc. determined that savings of up to 70% in toner usage can be achieved when using the PretonSaverTM toner and ink saving software. Composed of two revolutionary technologies (Pixel OptimizerTM & Elements IdentifierTM) PretonSaverTM products identify wasteful pixels and delete them. The different elements on the page (text, graphics, and images) are attributed a different savings level to maximize the required quality of each element. This sophisticated combination of technologies enables high quality printing of mixed element documents with maximum savings applied per element and not per page as a whole. Management of printing rules allows for even more ways to monitor and prevent excessive and unnecessary printing using quotas, regulations predefined across a network, and advanced printer settings. GHG emissions caused by manufacturing a single mono toner cartridge have been calculated to approximately 4.8 Kg of CO2. Furthermore, during the complete life cycle of a ton of office paper, the equivalent of 6.3 tons of CO2 will be emitted into the air. The Evergreen PretonSaverTM software helps reduce all that damage and cut down on the printing industry’s carbon footprint. Founded in 2005 by a team of engineering and business professionals with almost 40 years of successful software experience, Preton Ltd. is a leading provider of print management and toner optimization solutions headquartered in Tel Aviv, Israel. Preton’s award-winning products; PretonSaver EnterpriseTM, Preton Saver PremiumTM, PretonSaver StandardTM, and PretonSaver HomeTM offer revolutionary savings of up to 70% on printing costs. The products are sold in four continents through a partner network and serve hundreds of thousands of users every day. Next articleAJS on top of the world!